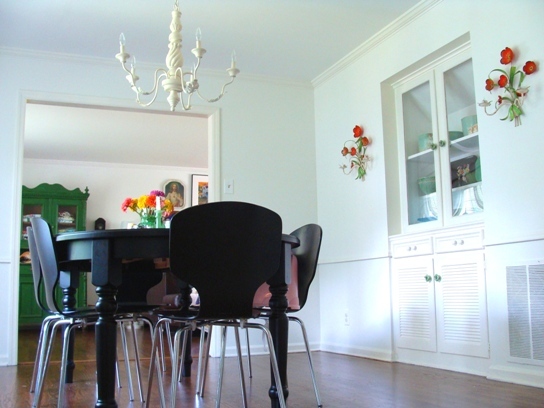 My formerly powder blue dining room (seen here) got a mini-overhaul. It’s now Alabaster thanks to the local Sherwin Williams store. I love that place. They really do have great paint. If they ever want a southern, slightly hyper, pear-shaped spokeswoman, they know where to find me. The funny thing is, I really like the blue color upstairs in the dressing room and bathroom, but somehow it irritated the phooey out of me in the dining room. So, Alabaster it is. It’s a really great white, warm and creamy without looking dirty. And yes, I realize my love of white walls is a little bit of a sickness. My friends think me very strange. I blame Rachel Ashwell and all her Shabby Chicness that blew my mind in college. I’ve never quite recovered. I also rearranged the plates in the kitchen on either side of the doorway, and there are officially five thousand nail holes in the walls. But the important thing is you can’t actually see the holes, and since we all know that’s what really matters, it’s all good. A couple of interesting things happened during this little re-do. 1. I found what I can only assume was a miniature tarantula in the corner of the dining room. He had weird legs and fur. I trapped him under a glass, and when I removed it, he jumped to nearly eye level with me. At this juncture I stepped backwards, into the paint pan, screaming, flailing, clearly not a match for a spider measuring no more than a centimeter. What can I say. He had fur. He wins. 2. No matter how many times I pressed “dislike” Pandora felt sure that I needed to listen to Sympathy for the Devil and Hotel California. Those two songs. They wear on my last nerve and I have no idea why. 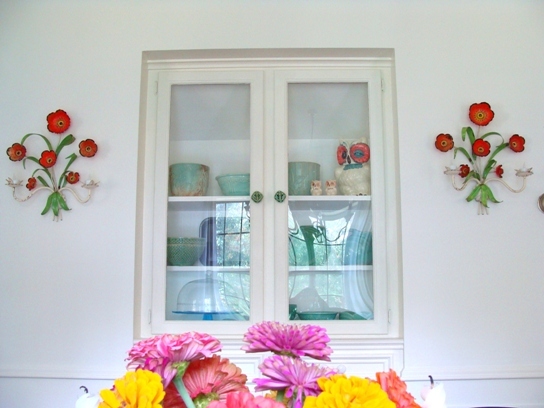 So to wrap things up, here’s the thing I’m learning about decorating: it just takes time. You have to live in a place for a while. You have to see what times of day the light changes, or which windows always face the direction storms move in. You have to watch tv at night, and fold laundry during the day. You have to cook on Saturday afternoons, and sit on the patio at night. Eventually, the house will tell you what it wants. 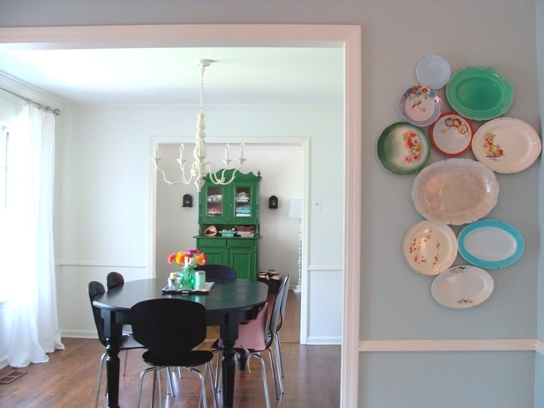 Rushing it only leads to powder blue dining rooms and badly hung art. I’m a case in point. Just a side note: I have Alabaster paint in my hair, still, two days later. I’ve washed my hair three times and it’s still there. I’ve decided to just own it. Like I did it on purpose.